Voltage Control - Wuxi Gold Control Technology Co., Ltd.
CTS for SCR single-phase AV voltage regulator uses cooling duct and insulation terminals design with national patent. With compact structure and nice appearance, work instructions for clarity, convenient installation, simple wiring and reliable work, etc. This controller is a new type of three-phase motor positive inversion controller, use to control within 4KW power of three-phase motor. 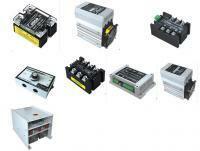 It’s widely used in the electric control of numerical control machine tool. It adopts three-phase two control or three-phase three control principle, which is through two phase voltage conversion to achieve motor reversing function. According to power please choice heat sink and special fast fuse, also install temperature control switch on the heat sink. CTM isolation three-phase voltage regulating module sets three-phase potential detection, phase shifting circuit, trigger circuit and three groups of anti parallel one-way SCR at an organic whole. It needn’t external synchronous transformer, through 1-5VDC, 2-10VDC 4-20ma signal, automatic control or external potentiometer manual control to achieve change conduction angle is implemented three-phase load voltage from 0 to grid whole voltage of adjustable steplessly. And it is widely used in industrial furnace, electric oven, lamplight illume, transformer primary surge in equipment such as temperature adjustment, dimmer, voltage regulating control, also applies to fan, pump motor control. Three-phase integration design, have power, control and fault indication, convenient installation, input and output terminal photoelectric isolation, built-in overheating protection function and the RC surge absorbing circuit, adjust the linear good, strong anti-jamming capability, which can be directly and temperature is used together. CTV type three-phase SCR trigger plate is using digital trigger thyristor realize voltage-regulation controller, voltage regulating using phase shifting control mode, the panel with a lock cirtle synchronous circuit, automatic discriminate phase and phase-detection, can choose current limiting, over-current protection etc. The trigger plate with 0-5V, 4-20ma intelligent PID adjustor or PLC, mainly use for industrial furnace heating control. Load type is three-phase resistance load, three-phase inductive load and three-phase transformer load. Three-phase load can be center ungrounded load, triangular load.